Saturated fats are bad for us and should be avoided at all times right? Wrong! Saturated fats have had a lot of bad press over the years but the last decade has seen a complete reversal in what we thought to be the truth about these vital and nutrient rich fats. It all started back in 1977 when a number of studies were published in the US and UK claiming that saturated fats were directly linked to heart disease. As it happens these studies were largely funded by leaders in the emerging palm oil industry. Looking to secure their commercial interests they set about demonising all forms of saturated fat which sadly included coconut oil. However, after many years and a number of recent revelations, the true benefits of this miraculous healing oil are slowly coming to light. Our cell membranes consist of around 50% saturated fatty acids that can only be found in coconut oil, butter and meat based fats. Saturated fats help to keep our bones strong as they are required for proper absorption of calcium. They lower Lp(a) also known as Lower Lipoprotein(a) and this substance is directly related to LDL levels (bad cholesterol) in the blood and can often be a precursor to heart disease. Saturated fats help to protect the liver from the toxic effects of alcohol, this may explain the popularity of fried breakfasts as the perfect hangover cure. Believe it or not there is now strong evidence to suggest that regular consumption of medium chain fatty acids can help to boost and enhance the immune system. Omega-3 fatty acids (having many health benefits including aiding brain and heart function) are better retained in the tissues when the diet is rich in saturated fats. Short and medium-chain fatty acids that can be found in coconut oil have a wide range of antimicrobial properties that help to protect us from harmful micro-organisms in the digestive tract. What is Unique About Coconut Oil? The medium-chained fatty acids that can be found in coconut oil are a great source of slow release energy that can be easily used by the body rather than being stored as fat. Another unique benefit of coconut oil is its ability to help regulate blood sugar levels. It does this by triggering a slower insulin release time which helps to avoid harmful sugar spikes. The lauric acid in coconut oil possesses powerful anti-microbial properties that can kill bacteria, viruses and fungi thus helping to stave off infections. 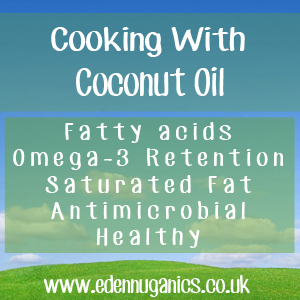 Coconut oil is one of the most stable and healthy oils to use in your frying pan. With a smoke point of around 350°F/175°C, this extremely stable fat is able to withstand high temperatures whilst maintaining its structural integrity. All fried foods will absorb oil thus by using coconut oil you are offering your body a vast range of benefits that simply cannot be gained from more traditional hydrogenated cooking oils. Is Coconut Oil Good for Frying on High Temperature Cooking? Do We Know When and How to Lower Lipoprotein(a)?